Mallard-LarkinClick on the image to enlarge and zoom in. The 260,000 acre Mallard – Larkins Roadless Area extends west from the Bitterroot Mountain Range, generally along the divide between the St. Joe and Clearwater River drainages, approximately 60 miles northeast of Orofino, Idaho. The landscape is dramatic: steep rocky ridges, deep canyons, rich forest, and nine major peaks over 6,500 feet. Flowing through the area are parts of three major river systems: St. Joe, Little North Fork Clearwater, and the main North Fork of the Clearwater, along with numerous large and small, fast-moving and crystal-clear streams. There are thirty-eight mountain lakes large enough to be named, of which Heart Lake is the largest at 35 acres. Although there are multiplicities of rock outcroppings, talus slopes, and barren areas, a major proportion is heavily vegetated. Extremely diverse, the greenery includes low elevation coastal-disjunct rainforest communities and impressive pockets of old-growth western red cedar, western hemlock, and inland western white pine. Near Isabella Creek, old-growth alder, Pacific Yew, and many different ferns thrive among ancient cedar giants. Throughout, several rare and sensitive botanical varieties are also found. The thirty-eight lakes lure visitors every summer. The rivers and larger streams are an ideal course for fish, including bull trout, Westslope – cutthroat, and introduced Kokanee salmon. Abundant wildlife communities flourish, ranging from elk, deer, and moose to black bears, mountain lions, and one of the largest populations of Rocky Mountain Goats. Sensitive species such as fisher, wolverine, harlequin duck, Columbia spotted frog, Coeur d’ Alene Salamander, and western toad find crucial sanctuary. 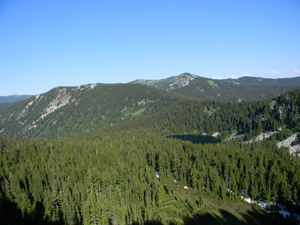 Access is provided over a network of roughly 280 miles of low standard trails, and while certain intrusions such as logging roads, outfitter camps, and establishments associated with fire control exist just outside the area’s border, there are swaths of up to 20,000 acres that are virtually undisturbed. Mallard – Larkins has a long history of support for wilderness protection: in 1969 a 30,500 acre portion of the high country characterized by abrupt summits and icy lakes was designated as a “Pioneer Area.” Challenging and diverse terrain, blissful solitude, and humility among the wild landscape are readily found in this inimitable place. Unfortunately, road building and logging have diminished this roadless area over the years, motorized vehicles have degraded some of the landscape, and future mining proposals exist. Restoration is needed around the edges of the area. 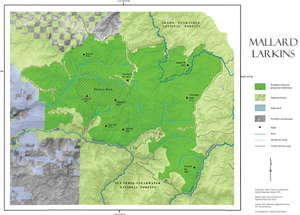 Descriptions of Other Roadless Areas on the Nez Perce – Clearwater National Forests.